Dr Samuel Johnson once said, ‘When a man is tired of London, he is tired of life.’ His oyster-loving cat Hodge possibly purred in agreement. This year marks my 10th year in London, and Dr Johnson has proved him right, well, to me at least. 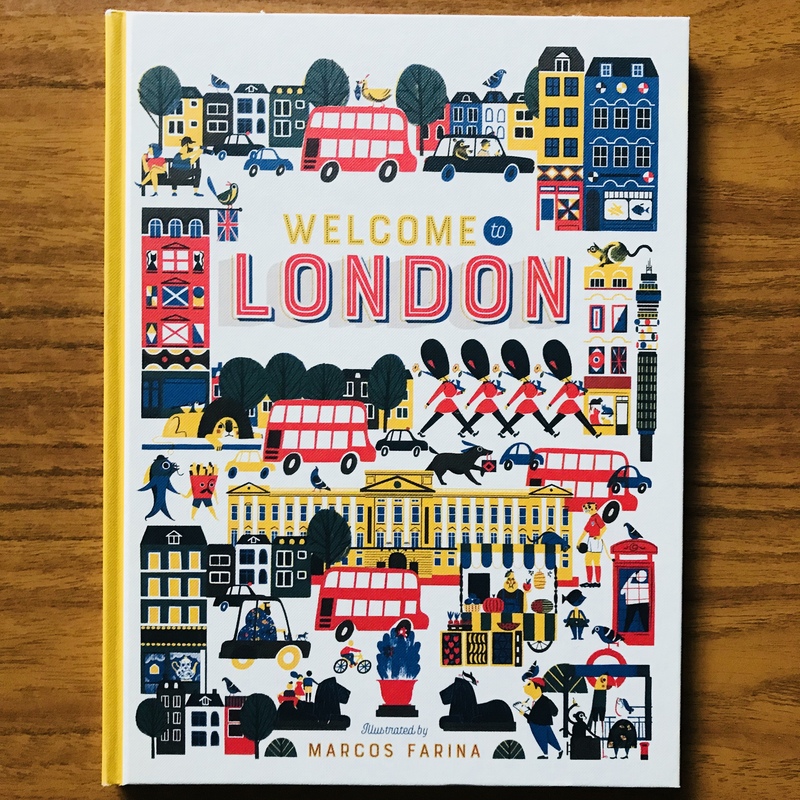 This month I present you Welcome to London by Marcos Farina (Button Books 2017) to share the charm and magic of the enchanting city I love. It’s hard not to compare Welcome to London with the good ol’ This is London by Miroslav Sasek (Universe Publishing 1959) as they share the same concept and format. Both illustrate people, fashion, architecture, transport and local details that flesh and blood of the vibrant city. It’s interesting to compare those two books. You can see both how much and how little London has changed over six decades. The fact that both books are equally fascinating proves that the city has always been and still is one of the most magical cities in the world. Marcos Farina’s clean but vibrant illustrations perfectly capture the buzzing energy of the busy capital city without being messy. I’m sure children enjoy the humour Farina has injected throughout the book. There also are many details that would make grown-up grin (e.g. Larry is the Chief Mouser at 10 Downing Street). I love the way Farina filled his version of London with human, animal and anthropomorphic animals. This is the most creative way to illustrate the diversity that I see as the best characteristic of the city. Welcome to London features mainly iconic and popular places in London. But what make this book more insightful is the snippets of information and revealing facts interspersed among Farina’s arresting spreads. Even I learned some facts! Reading this book is like a taking part in a guided walking tour around the city (which is indeed one of popular activities in London). In short, Welcome to London is a updated version of This is London. This book works in two ways. If you live in or have visited London, the book serves almost like a holiday photo album that reminds you of fantastic time you had and makes you want to visit the city again. If you have never been to London, this book will be a great guidebook for children. I’d be surprised if this book fails to arouse their curiosity and make them want to visit this magical city one day.